In Arkansas’ Senate contest, Rep. Tom Cotton (R) has a new ad that goes after Sen. Mark Pryor (D) for his comment that Cotton feels a “sense of entitlement” because of his military service. Cotton humorously utilizes his Army drill sergeant to talk about how his time in the military taught him “accountability, humility and putting the unit before yourself,” all qualities that voters might desire in a senator. Cotton’s military background and Pryor’s ill-considered remark about it could conceivably matter more in Arkansas than in some other places (though there’s little evidence it has mattered so far). Based on 2013 estimates of adult and veteran populations, the Razorback State has the 13th-largest percentage of veterans as a proportion of its adult population (11.1%). That means there are a fair number of potential veteran voters in Arkansas: about 250,000, although the actual number who will turn out in a midterm will be far less. Hypothetically, these voters might be more receptive to Cotton’s candidacy because of his military background. Examining Arkansas’ veteran population naturally led us to look at the country as a whole. Below is a map of states colored by what portion of their adult populations are veterans. Note: Doesn’t include adult and veteran populations of Puerto Rico and other U.S. territories. Veteran data does not include active duty members of the armed forces. 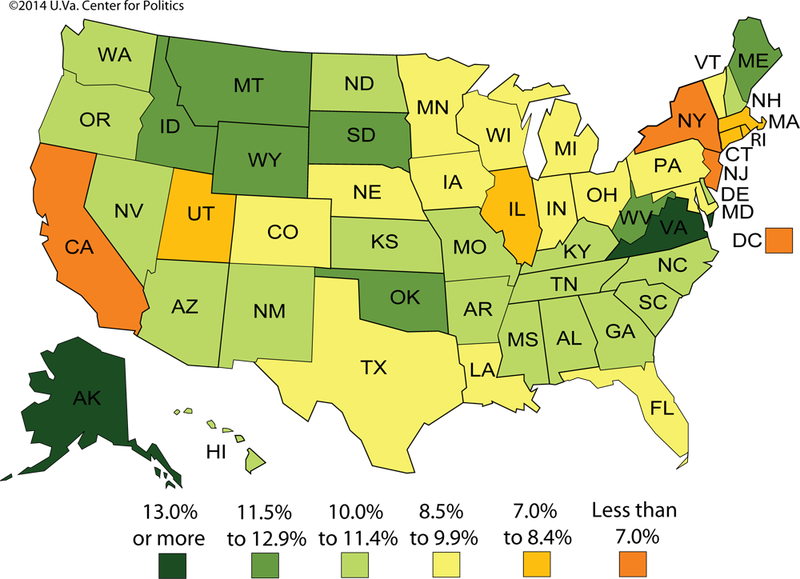 For a PDF of state data, click here. Alaska has the highest percentage of veterans in the country, followed by Virginia. The South and Interior West have higher percentages of veterans as a portion of the population compared to much of the rest of the country. But it’s important to remember that some states, such as California, Texas and New Jersey, have larger non-citizen populations, which impacts the proportions to some degree. Although some non-citizens decide to serve in the military as a means of gaining citizenship, most do not. Of course, just because Cotton served in the military doesn’t mean that veterans are more likely to flock to him. As National Journal discussed in the lead up to the 2012 election, veteran voting behavior is more heavily influenced by factors such as party affiliation, ideology and religion, just like voters with no military background. A look back at past presidential results shows this: Veteran voters narrowly backed Bill Clinton in 1992 over George H.W. Bush (albeit in a three-way race), a World War II hero, and then in 2004 supported George W. Bush by 16 points over John Kerry, a decorated Vietnam veteran. In 2008, veteran John McCain did win veterans by 10 points, but as we’ll see, this was mainly a function of party identification and ideology. Unfortunately, the 2012 national exit poll did not ask broadly about military service, only asking it in Virginia, where President Obama and Mitt Romney tied 49%-49% among the 15% of the Old Dominion electorate that had served previously or who served at the time. Regrettably, 2008 Virginia top-line data is unavailable for the same question, making a comparison impossible. Nevertheless, it’s likely that Cotton’s Republican Party identification will aid him more among veteran voters than will his veteran status. In Arkansas, 84% of veterans are non-Hispanic white, and white voters, particularly those in the South, are more likely to vote Republican. Moreover, the overwhelming majority of veterans are male, and men are more likely to vote Republican as well. Nationally, a 2011 Pew Research Center study found that nearly half of all veterans (48%) say they are politically conservative, compared to 37% of the public in the same poll. Veterans are generally more likely to identify as Republicans than Democrats, which again can perhaps be tied back to race. 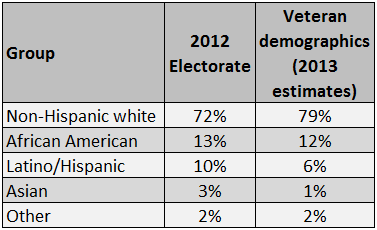 As Table 1 shows below, veterans are whiter than the electorate as a whole, and therefore it makes sense that they might be more inclined to vote Republican.